A new website is up sparked by the City's ten-year budgeting of zero funds for capital improvements in Davis Square through 2027. The site details repairs immediately needed, with pictures and cost estimates for repairs. "DavisNow.org focuses on fixing problems now. It does not address the City’s long-term plans for Davis Square, such as increasing building heights, altering intersections, or completely replacing sidewalks. This is a much more modest scope and cost proposal. It’s just what’s needed to renew the elements we already have. "We plan to have a community meeting... to discuss what our next steps should be and how to partner with city officials to fund these needed repairs." The plans for the present garden areas are disturbing. Over the decades, the Somerville Garden Club (which is not associated in any way with this opposition) has designed and maintained lovely gardens around the library and has planted several significant trees, including Somerville’s only Dawn Redwood, two Columnar Beeches, and a Fernleaf Beech, among others. All are rare and mature and are great landscape features. The current design plan would remove all of these trees. 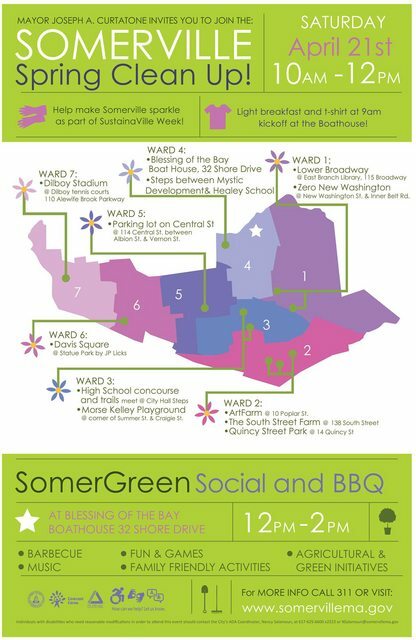 First: it flies in the face of the City of Somerville’s policy of maintaining and acquiring new open green spaces. The past 20–30 years have been significant in the history of the city. The advocacy for green spaces, street trees, and gardening under Mike Capuano’s and Joe Curtatone’s terms as progressive mayors who actively encouraged the development of public green spaces and private gardens, has been a glorious period of renewal. Their advocacy of gardening contests and awards and their hiring of a city Senior Planner/Landscape Developer to help implement green plans and acquire new green areas have been tremendously revitalizing throughout the city. All of these changes—including the development of the West and Main Branches of the Library—are as valuable a part of Somerville’s history as are the historical monuments and homes. These sites deserve preservation, and not an opportunistic “update” of a site which is a monument to the best changes brought about during the past years of Somerville history. The West Branch Library building was designed by McLean and Wright of Boston, and was built in 1906–09 with funding from philanthropist Andrew Carnegie and the city. It is the city’s best example of Classical Revival architecture, also exhibiting Beaux Arts details that were then in fashion. It was the first branch library in Somerville . Second: the projected concrete plaza area would not be low maintenance, as claimed, but would, rather, be much higher maintenance than the gardens have been. There are mulberry trees on adjacent lots that would cause considerable mess. And most of the garden maintenance is done by SGC members, aside from occasional mowing. Third: the projected plaza would be redundant, since there is already a nicely paved plaza area across the street from the Rite Aid on Highland Ave.
Fourth: the tax burden ($6–8 million) would be substantial, especially at a time when the Green Line Extension and Somerville High School projects are placing additional tax stress on residents. Fifth: the addition of a meeting/performance space intended to accommodate a hundred people would mean that dozens of people at once would need parking in the Davis Square area. Yes, the Red Line is right there, but many people don’t use the T and/or would be coming from other directions. Traffic and parking problems are already severe in the Davis area—we don’t need more. Members of the Somerville and Davis Square communities in general and the library property abutters in particular are all opposed to the current design. All parties are in favor of renovations to the existing building—and would be happy to see additional funding granted to upgrade the library’s services. But we oppose any other alterations, except insofar as are needed to make the existing building ADA compliant. We do appreciate the need for more meeting and performance space in Somerville. But the proposed addition wouldn’t even be good for these, since they would be squeezed into a site not fit for the purpose. Further cramming of the small library lot, increased parking demand, and a considerable tax burden on the residents of Somerville (just at the time when we’re about to be whacked with Green Line and High School project expenses)—all for a project of dubious value that the people don’t really want—all seem like a no-go. This meeting will review and discuss the renovation and scope of library program services in the historic structure. There will be discussion of the community’s preferred landscape alternative. The meeting will discuss the scale and viability of the proposed community room addition. The ultimate objective is a project that meets the goals outlined by the community and garners the support of direct project abutters. 1. Make sure they’re on Steve Vitello’s (the Project Manager’s) email list (by calling or emailing him at svitello@somervillema.gov 617-625-6600 x5124). 3. Join the Google Group moderated by Ulysses Lateiner and Janet Campbell. (https://groups.google.com/forum/#!forum/somerville-west-branch-library-renovation). We’ll make sure you’re up to date on what’s going on! The city is removing 155 trees because of ash borers. There's a public hearing about this issue on May 25 at the DPW building, 17 Franey Road, 5:30 PM. I hope the city will replace the trees, but the person I talked to at 311 didn't know if this would occur. Now that I'm looking at this list of trees, I don't think it is complete. There is a tree at 268 Willow that is marked for removal, but it is not on the list. Reposting from another online source. On Saturday, May 7 from 10 am - noon, starting in front of the CVS, there will be a walking tour about the history of the neighborhood that goes from the CVS in Magoun Square (that's the next big intersection on Broadway east of Ball Square), down Lowell Street, Hudson Street, Benton Street, and then turning onto Highland near the Armory and ending up at Lowell Street. The neighborhood once included a Hostess Cupcakes factory; a Hires Root Beer plant, some houses going back to the 1870s and other surprising history. The land was once a farm owned by an abolitionist. This will be an informal tour with everyone invited to contribute what they know. It is part of the international Jane's Walk, an event of neighborhood walking tours inspired by Jane Jacobs, the urban renewal activist who saved Greenwich Village from being a big highway. The walk is sponsored by the Somerville Historic Preservation Commission. It will be video'd and that will be on http://www.somervillema.gov/departments/.... There are already some great videos of past walking tours if you click on Brochures and Self-Guided Tours. May is Historic Preservation Month in Somerville so check that site for other events in May. We will be relaunching the Somerville by Design in Davis Square on April 27th, 2016. This is the kickoff meeting to review the major topics coming out of the open house: building heights, cooperative management, and the public realm. Gehl Architects, the same firm that helped Somerville conduct the world’s first city-wide Public Space Public Life survey, will be attending to review next steps in planning Davis Square’s public realm. While it's certainly not uncommon for me to be clueless as to the redevelopment going on around me in Davis I was kind of surprised when I got a notice of the Somerville Street Improvement Project starting in Davis next week. I'm certainly all for the improvement of the streets and sidewalks of my neighborhood, but was shocked to learn they're going to be replacing the charming red brick sidewalks with poured concrete. Anyone know more about this? I have kayaked up to this buoy and wondered what it was doing. Mystic River Watershed folks will have an open meeting to share some info. Have you ever noticed the buoy in the Mystic River near the Blessing of the Bay Boathouse in Somerville? While deployed, this solar-powered buoy takes water quality measurements every 15 minutes and sends this information to the EPA website, allowing public access to near real-time conditions. On Tuesday, March 1st, hear from Tom Faber, Water Quality Environmental Engineer, US EPA, about the results of this program to date. This presentation is part of the Mystic River Watershed Association’s monthly Committee Meeting. The meeting begins at 7:00 p.m. on March 1, 2016 at Tufts University, Tisch College of Citizenship & Public Service, Lincoln Filene Hall, Rabb Room, 10 Upper Campus Road, Medford. Today I received a citation because a tree in my yard is partially obscuring a street name sign. I've lived in Somerville for 25 years and never heard this was the responsibility of the home owner or heard of anyone receiving such a citation. I think the city is reaching into the depths of ordinances to find ways to raise money. If it's so important, why didn't any of the gazillions of emails I receive from the city mention it like they mention snow shoveling? I've heard of other places which enforce such ordinances as a way to achieve public good--not to raise money. In such places, it is official policy that if you correct the problem and bring evidence to the hearing officer, the fine will be suspended. Well, I guess people who live near the station will need earplugs tonight... my sympathies. Subject: MassDOT Green Line Extension Overnight Work Tonight At School St.
Street Bridge work & lane closure which began in April 2015. Hey kids, I was wondering if anyone had any recommendations for a local service that can take back some unruly, unmaintained grape vines? Thanks! pch1.livejournal.com - pruning grape vines?